E Elvis is available for your party with the American Eagle Suit, or six others professional made suits. Audience participation to Viva Las Vegas, Johnny Be Good, Jail House Rock, and "Can't Help Falling in Love With You". A real family oriented show!. You Get: Marti Gras beads for all the ladies when E Elvis does Love Me Tender & Wonder of You . Audience participation ; Inflatable 42 " Rock N Roll Guitars for the guys when they do Jail House Rock & Johnny Be Good With E Elvis ; Maracas For Gals when they do Viva Las Vegas With E Elvis ; Great pictures for after the show. Don't miss E Elvis he a Showman With The Voice Of Elvis; Dead On !! You will have the Best Of Times ! Elvis gave my Grandmother her best birthday! My Grandmother was thrilled, I have never seen her happier. They had some technical difficulties with their equipment which delayed things a bit, but it worked out in the end, as my husband had them use our system. Overall it was a great time! E Elvis had great time for your Grand Ma's party with the American Eagle Suit, Audience participation to Viva Las Vegas, Johnny Be Good, Jail House Rock, and a Family Circle Dance to "Can't Help Falling in Love With You". A real family oriented show!. You Got: Marti Gras beads for all the ladies when E Elvis does Love Me Tender & Wonder of You . Audience participation ; Inflatable 42 " Rock N Roll Guitars for the guys when they do Jail House Rock & Johnny Be Good With E Elvis ; Maracas For Gals when they do Viva Las Vegas With E Elvis ; All the props are complements of the show to keep and Souvenirs of The Show. Great pictures for after the show. Don't miss E Elvis he a Showman With The Voice Of Elvis; Dead On !! You will have the Best Of Times ! E Elvis is available for your party with the American Eagle Suit, Audience participation to Viva Las Vegas, Johnny Be Good, Jail House Rock, and a Family Circle Dance to "Can't Help Falling in Love With You". A real family oriented show!. You Get: Marti Gras beads for all the ladies when E Elvis does Love Me Tender & Wonder of You . Audience participation ; Inflatable 42 " Rock N Roll Guitars for the guys when they do Jail House Rock & Johnny Be Good With E Elvis ; Maracas For Gals when they do Viva Las Vegas With E Elvis ; All the props are complements of the show to keep and Souvenirs of The Show. Great pictures for after the show. Don't miss E Elvis he a Showman With The Voice Of Elvis; Dead On !! You will have the Best Of Times ! DESCRIPTION: Companies may bid low providing entertainment,and then never show up, for more money they leave you without entertainment and disappointed. Here at All4Fun we never over book or cancel a show for more money. We issue contracts and have back up performers. All4Fun has performed over 1175 shows and have never cancelled a show.Here at All4Fun we enjoy life and hope to provide joy to you....The Polynesians call it lamalama ka'ili, enjoying every moment in your life, even those times when you are feeling ill or not too happy with your life. The Polynesians taught that a joyful and healthy life was based on our seventh sense the instinctive drive to what is healthful and pleasurable. It was manifested in what they called aloha. Alo means to share and ha to breath, literally to give and share the breath of life.. Hula is synonymous with Hawaii. It is the thread in which Hawaiians and non-Hawaiians connect to find that special place in everyone's heart that is true and pure. It is a way of life that brings joy to those that dance hula and to those that view the dances. We bring the joy and excitement of the Hula Dancers to your home, private party, or any other venue. E. Elvis Chicago brings the excitement of this performance and the beauty of Hawaiian Hula Dance for a high energy interactive show your guests will always remember for your Luau event. Our shows are 1 hour long and can be performed at your home or banquet hall. Special lighting effects can be added to our show at an additional cost for large or special events.You can choose our hula dancers and a fire dancer, Or a show designed for both men and woman, Our Elvis Aloha Hawaii Show with hula and fire dancers , a spectacular show your guests will always remember , do it , you guests will rave about it , enjoy the summer here in Chicago , as we are in Hawaii !! Elvis Presley made television and entertainment history with Aloha From Hawaii Concert as this was the first-ever live concert broadcast over satellite, reaching over one billion people worldwide. E. Elvis Chicago brings the excitement of this performance and the beauty of Hawaiian Hula Dance for a high energy interactive show your guests will always remember for your event.Our shows are 1 hour and can be performed at your home or banquet hall. Special lighting effects can be added to our show at an additional cost for large or special events. Elvis Aloha Show; Includes Elvis And 1 Hula Dancer, It includes costume changes, hula lesson, for both guys and gals,Great laughs ! audience participation, featuring the dances from the different islands. This is the first time we ever booked a talent show online and frankly did not know what or who to expect. Your professionalism over the phone from the very start eased our minds as our request was processed. The audio and video online also helped us make our decision about booking the act. 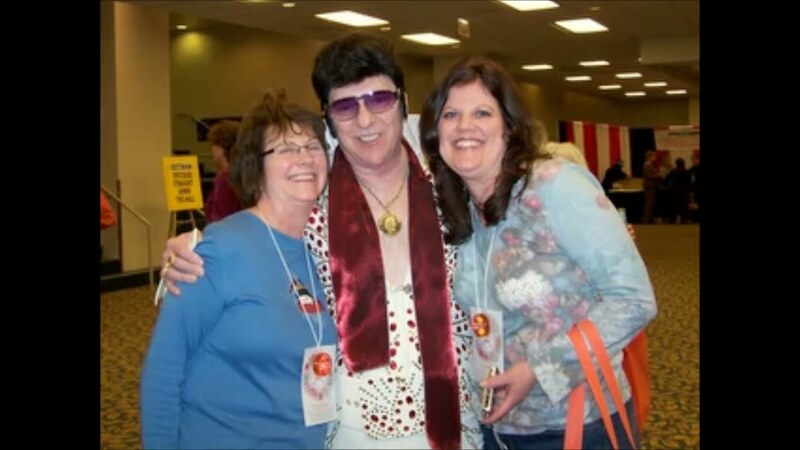 Elvis was very professional and really came across as the "real thing" for our party which really made the party a huge success. Everyone left talking about Elvis and how great he looked and performed. Thank you so much and we would definately hire Elvis and use your services again. My Elvis was a fabulous plus to our red hat event. The ladies loved him and he was right on target with cooperating, singing, and just making all the ladies feel very special. Great show!!! The Elvis Impersonator was wonderful. He was a big hit with my mom and her teacher friends. I will definately use All4Fun on my next event! !